A competitive OTC offering to that of the mainline wholesalers. Sigma’s comprehensive OTC range can support you with all of your OTC (Health & Beauty) requirements. With 90% of our OTC range available as singles/splits, customers can benefit from the same discount on singles as an outer, with no minimum spend threshold. Giving you flexibility of ordering, as and when you need. Working with both the larger and smaller pharmacy brands and companies, Sigma aims to have a product or range for each category within community pharmacy. 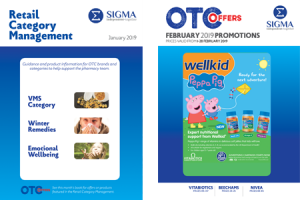 Our monthly OTC promotions catalogue is full of great exclusive offers. These promotions are carefully chosen to include big brands and best sellers. Our highly professional and experienced team will process all received transfer orders within 24 hours. As long as we have the stock, customers can even receive their transfer order the same day*. In the rare case of us not having stock to complete your transfer order, we keep all back orders and aim to deliver within 5 working days** of receipt. To take advantage of receiving your transfer order through Sigma, advise your Rep to send your order to Sigma. Or speak to your sales executive if you would like to know more about our offering. * Depending on driver schedule.